Superior in design, the Research Series has a wide range of features designed for University and Laboratory use. 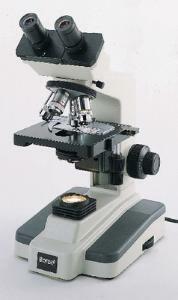 This large, heavy microscope, with an all-metal chassis and reagent-resistant finish is ideal for frequent use in the lab. It features interpupillary and diopter adjustment on both eyepieces for easy and comfortable use, as well as a 360° rotatable head, retractable 40xR and 100xR objectives to protect slides, and a movable Abbe condenser. Supplied with a blue and green filter, immersion oil, Ward's Microscope Manual, and dust cover.